Visit Biltmore Estate, explore Chimney Rock State Park, enjoy a romantic weekend getaway, or even host a family reunion with these lodging packages during your stay at Inn on Mill Creek. Need a unique and thoughtful gift for a loved one? Consider the gift of relaxation at a Bed & Breakfast in the beautiful mountains of western North Carolina. Our gift certificates are personalized, never expire, and can be e-mailed to you within 24 hours. You can purchase gift certificates for a specific dollar amount (minimum $50), or give the gift of a stay in a specific room at the Inn on Mill Creek. Please contact us via phone (828.668.1115) or e-mail to request a gift certificate, or if you have any questions. The early bird gets… a special rate when reserving two nights at the Inn on Mill Creek in April. Enjoy a fabulous breakfast while watching as nature brings forth the magical Spring season in Pisgah National Forest — then get outside and explore the outdoors around the Asheville area with a waterfall hike, a forest walk, a guided fishing adventure or birding excursion, visit the blooming gardens of Biltmore Estate, the North Carolina Arboretum and the Botanical Gardens, or check out vibrant Asheville. You’ll see this rate available to select when making your reservation online. With so much to do… or so little, if that’s your preference… here at the Inn on Mill Creek B&B and in the mountains of western North Carolina, you might very well find yourself wanting to stay a while. Reserve a room of your choice for three or more nights from April through December, and enjoy our Extended Stay discount of 10% off your reservation. Weekends and holidays included? Yes! You’ll see this rate available to select when making your reservation online. Having family members and friends represented in all branches of the military, we extend our gratitude and appreciation to all the courageous men and women who serve our country. Active duty members of the military and war veterans receive a special rate as a way of saying Thank You for your service. If reserving online, select “Military Appreciation” under Special Rates. If reserving over the phone, we will apply it before sending your confirmation. Please remember to bring proof of service if you are a first-time guest. We’re fortunate to be near Biltmore Estate, with its awe-inspiring house, fantastic gardens and grounds, plus Antler Hill Village and Winery. Guests can purchase daytime admission tickets right here at Inn on Mill Creek at a discounted rate with no added fees, plus your tickets are good for a free second day. You can order tickets when you make your reservation online or by phone, or you can wait until you arrive to let us know – whichever is easiest for you! 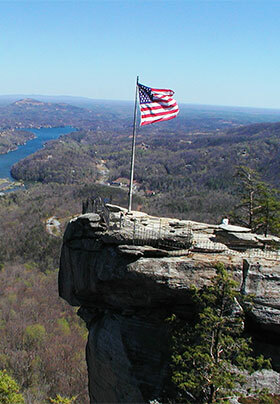 We offer coupons for $2 regularly priced general admission at Chimney Rock State Park. Chimney Rock Park is just 35 minutes south of the Inn on Mill Creek, via scenic Route 9 — perfect for a day trip! Check out the granite monolith that gives the park its name, and explores hiking trails (one of which leads to the base of the 404-foot Hickory Nut Falls), kid-friendly activities and opportunities for guided nature and birding walks. We call wintertime in the mountains the Quiet Season for a reason. Guests love coming to the area to relax and de-stress after the holidays, enjoying the scenery with fewer crowds than in the spring, summer and fall seasons. And our Quiet Season special rate gives you a little more green in your pocket as the year gets started. Below are popular additional amenities that you can add to your reservation or add as a gift. Please order in advance to ensure availability, and let us know if it’s a surprise and we’ll help with keeping it hush-hush! Celebrate in sweet style! We use a local bakery that makes their mouthwatering cakes and icings from scratch, and they make a perfect cake for two. Please allow three days’ advance notice to order so that your cake will be ready for you and your special someone when you arrive at the Inn. Please specify in your reservation that you would like to order the Scrumptious Cake for Two and we’ll be in touch to assist with the details. The way to the heart is…with chocolate. Tempting to the sweet tooth and a great surprise for your loved one! Order delicious chocolate covered strawberries for $25 (plus a $5 delivery for each order). These delicacies are hand crafted by Anne’s Custom Catering. Please specify in your reservation that you would like to order the Strawberries and we’ll arrange to have them at the Inn when you arrive. 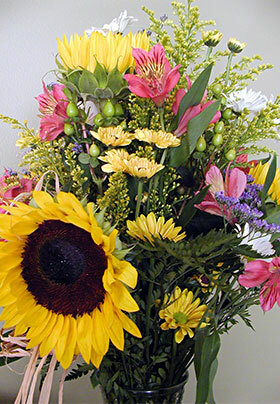 Surprise your special someone with a dozen roses (market price) or a wildflower bouquet ($59 arrangement). Please indicate in your reservation that you would like flowers for your room and what you’d like the enclosed card to say, and we’ll arrange to have them in your room prior to your arrival. Costs above do not include any delivery/pick-up charges. Please e-mail us for group rates or to reserve rooms for your group. Local massage therapist Louise Owen has been a licensed massage therapist since 2004, and provides excellent massage services to our guests. To schedule an individual massage or back-to-back massages for two in the privacy of your room, please contact Louise directly at (828) 407-8823 or thebodymatrixmassage@gmail.com to make an appointment and arrange for payment. Be sure to tell Louise that you are a guest of the Inn on Mill Creek. For off-site individual or couple massage as well as spa services, we recommend Shoji Spa in East Asheville, which gets rave reviews from our guests. Please contact Shoji directly at (828) 299-0999 to make your appointment and arrange for payment. Congratulations to you and your loved one on your upcoming nuptials! Elopements can take place any time of year, indoors or out, at the Inn on Mill Creek B&B. For small weddings with up to 15 guests, we host outdoor ceremonies from April through the first weekend in October. Please visit our Weddings page for more information. Inn on Mill Creek has a great relationship with SUWS of the Carolinas/Phoenix Outdoor, therapeutic wilderness programs. We offer accommodations and breakfast for guests who are attending workshops and coming for graduations, plus the option to return to the Inn for showers after the overnight in the field. Visit our SUWS lodging page for info.